The 55th Massachusetts Infantry Regiment was a volunteer regiment made up of men who wanted to enter the already full 54th Massachusetts Infantry Regiment in the Union Army during the American Civil War. The 54th was the first officially recognized black military unit in the United States. When Massachusetts Governor John A. Andrew in 1863 saw the demand for enlistment in the 54th, he created the 55th Regiment. Like the 54th, the 55th would be commanded by white officers, many of which were of abolitionist families. The soldiers comprising the 55th were recruited by white and black abolitionists such as William Lloyd Garrison and Frederick Douglass from across the North. Abolitionists spoke at churches and rallies where they urged free blacks to join. Some of those who joined may have been fugitive slaves as well. When the men did join, they were provided with quality accommodations and conditions which helped to recruit more black soldiers. So many African American men volunteered to serve in the 54th and 55th Regiments that medical examinations had to become more thorough and selective which worked to produce strong and healthy regiments. The soldiers did, however, face discrimination in the amount of pay they received for their service. African American soldiers made $10 per month while their white counterparts made $16 a month. This pay discrimination caused many black soldiers and some of their white officers to protest, refusing to take any pay until the black soldiers were equally paid. In June 1864 the U.S. Congress passed a bill to approve equal pay among all races. After training at Camp Meigs near Readville, Massachusetts, the 55th Infantry Regiment saw the majority of its action in South Carolina. They were used mostly for “picket duty,” serving as advanced scouts before the frontline in order to feel out the enemy before an actual battle, and digging trenches while under enemy fire. They served under General Truman Seymour in the 1864 invasion of Florida where they took part in the Battle of Olustee on February 20. The 55th also saw action in battles once they returned to South Carolina. First, they fought on James Island in May and later in July of 1864 and also the Battle of Honey Hill in November of the same year. As the Union Army made headway on the Confederate forces throughout South Carolina early in 1865, troops began to close in on Charleston. Led by General William Tecumseh Sherman, Union soldiers took Columbia, the state capital, on February 18 which prompted the Confederate forces to burn their supplies in the city of Charleston and retreat inland. When the Union troops finally reached Charleston on February 21, they met crowds of liberated slaves and free blacks who rejoiced at their arrival. 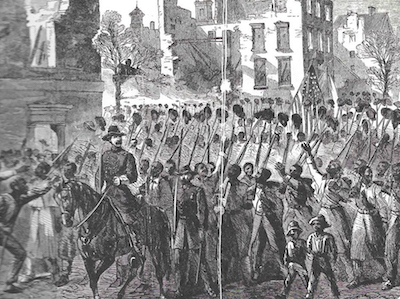 Although the 55th Massachusetts Infantry was not the first black Union unit to enter Charleston, symbolically important as the birthplace of the Civil War, they did arrive to the shouts and cheers of newly freed women, men, and children. The 55th Massachusetts Infantry Regiment remained in South Carolina for the remainder of their service where they fought other battles at Briggen Creek on February 25 and Saint Stephens on March 1. The also occupied Charleston through much of the summer of 1865 before finally returning to Massachusetts where they were marshaled out of service in Boston in September of 1865. Charles Barnard Fox, Record of the Service of the Fifty-fifth Regiment of Massachusetts Volunteer Infantry (Cambridge, Massachusetts: John Wilson and Son, 1868); Paul Finkelman, Encyclopedia of African American History, 1619-1895: From the Colonial Period, Volume 2 (New York: Oxford University Press, 2006); William A. Gladstone, United States Colored Troops, 1863-1867 (Gettysburg, Pennsylvania: Thomas Publications, 1990). Troops, 1863-1867 (Gettysburg, Pennsylvania: Thomas Publications, 1990).